After the Korean war my dad got assigned to Fort Richardson and claims he pulled the first house trailer over the Alaskan Highway. He got out of the Army and started a used furniture store buying furniture from military leaving Alaska and selling it back to military arriving. I joined him and my stepmother in 1956. We lived in a little white house with green trim at 159 Eagle Street. I was 9 and here is what I remember. There were some project apartments across the street. There was a Carrs Food center nearby and behind it a very steep hill that we used for sledding. 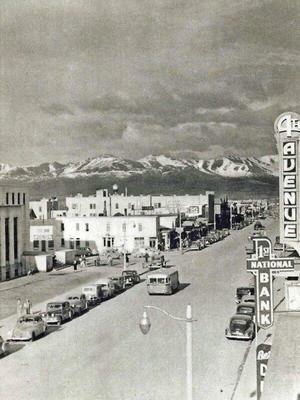 I remember going down to 4th avenue and watching the Fur Rendezvous when the dog sleds took off. The Coca Cola plant was down the hill from 5th Avenue. We shopped at Monty's department store and went to movies at the Denali Theater. After a while my dad gave up the furniture business and went into business with a military buddy and started plowing snow from parking lots in Anchorage. This lasted for a winter or two when he hooked up with a partner and we were off to Kenai. For the next many years we were the local distributor for Standard Oil. Hauling fuel from Homer to Kenai and delivering it to the area around Kenai, Ridgeway and Soldatna. For many years my Dad and Mother often told the story that if they had only homesteaded they would have owned what is now Spenard. From 9 to 19 I lived in Alaska and loved every minute of it; The fish, the bears, the moose, the berries, the rhubarb, and ice skating. Alaska became a state, and I remember the earthquake, That is another story.